I used the OWH bonus sketch that was presented along with Sketch #123 this week. Lots of flourishes here, with the papers, die cuts and stamp! 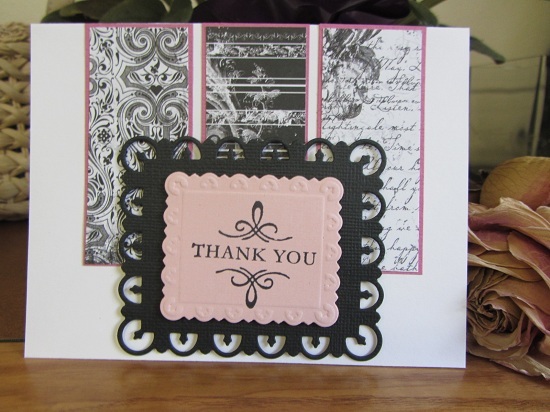 As it turned out, it was perfect for the OWH Midweek Throwdown challenge for thank you cards. The troops always request lots of thank you cards to send home, so this challenge will hopefully inspire folks to make a good amount to ship out. Thanks for stopping by! This entry was posted on Wednesday, May 30th, 2012 at 2:45 pm	and tagged with cardmaking, die cuts, stamping and posted in Challenges, OWH, Thank You. You can follow any responses to this entry through the RSS 2.0 feed. Nice mix of black and white prints in the background! Another great one, Yvonne! Love that die cut. That’s a lovely die cut! Great color palette, too! This is so elegant! Beautiful card. Black and pink are so elegant together. Stunning card!